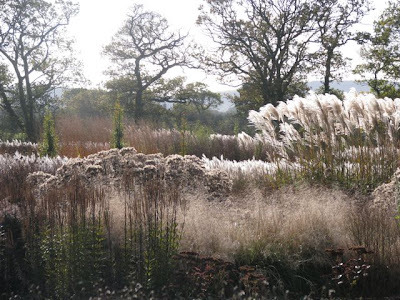 If you're a Piet Oudolf fan, you'll love this!! 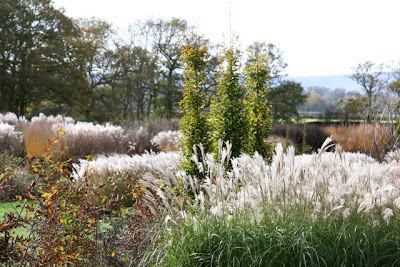 Owned and run by delightful husband and wife team, Paul and Pauline McBride, this six-acre garden is a dream - even in early November - and reminiscent of Piet Oudolf's "naturalistic" style that we all love so much. The McBrides are an interesting couple - they worked in Luxembourg for 12 years and for part of that time with Piet - and then returned home to create the Sussex Prairie Garden - which they've managed to do in just under two years! Pauline describes the garden as a "big sharing experience", and questioned further, she explains that when they came to create the garden, "everybody" came to help with planting the 30,000 plants you see there today! But it's not just swathes of wonderful plants you'll see here, there's also the sheep - real, rare-breed Shetlands, like the ram below and interesting sculptures (above); wonderful views over the surrounding Sussex countryside; and, if you head for the cafe, a taste of Pauline's delicious home-made cakes. But most interesting is the McBride's philosophy that you should engage with their garden - they want you to walk through the circular perennial beds and really see the plants - and have laid paths throughout the borders so you can get in touch with what's growing. This is definitely a "must-see" garden to put on your list for 2010 - details of openings can be found on the website and, if you're planning a trip to the area, you could even stay with the McBrides, who are offering wonderful bed and breakfast! It looks beautiful. I love the grasses this time of year. very nice photos!.. It´s always nice to come back here! I think this sort of garden really comes into it's own at this time of year. Stunning layering of textures in the first photo. You are so right to decide to share this garden with us. 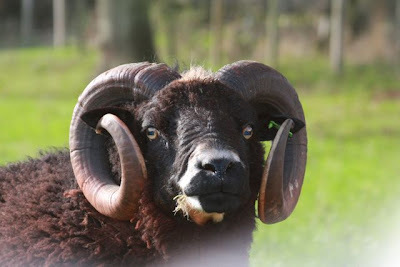 I love the sheep you photographed, real and sculptural, and admire historic sheep breeds and the folks who support them. These grases give such nice movement to the landscape. Gorgeous garden. Please do have a safe and wonderful trip! Hi Tiggerlot, I love this. 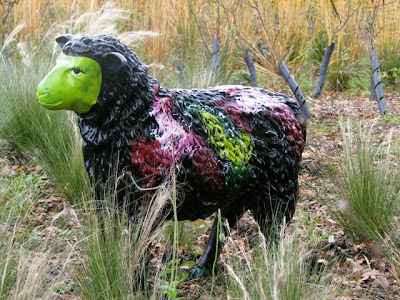 My only question is, do the sheep eat the plants or are they sequestered to a specific area? Obviously they aren't doing too much damage. I just wonder how the two can exist in harmony. Sheep are hungry. Plants are vulnerable. 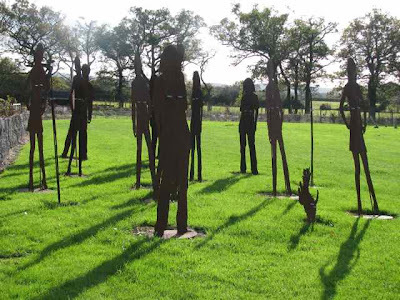 :) Love the people sculptures too. I am so glad I found your blog through blotanical - I have visited the UK many times but never did visit these beautiful gardens. One day my husband I and I hope to return and visit a few of these places! Thanks for sharing. Michelle "Mich's West Coast Journal"